Review: This is the second in the Jack Daniels series. I read the first (Whiskey Sour) back in 2011 and am wondering why I waited so long to get to this book. I thoroughly enjoyed it! I have to just start by saying that Jacqueline “Jack” Daniels is one of the funniest characters I’ve enjoyed in a long time. And the trouble she always seems to find herself in – you can’t help but laugh about it. While this book was primarily set in Chicago, IL, Jack has to make a flying trip down the state to Carbondale after a connection is made to Southern Illinois University. I still smile when I think about it – I graduated from SIU in 2007, I don’t think I’ve ever read a book where SIU was mentioned! I thought that Konrath really gave SIU a great shout-out when the school and Mortuary Science program was included in the book (and, FYI, the mortuary science program at SIU is actually a very good program). I thought that the characters really got some good development. Jack’s partner, Herb, is going through a mid-life crisis, Jack is dealing with her stubborn mother, an ex-husband that makes an unexpected (unwanted?) appearance in her life and a boyfriend who wants her to move in with him. All this is going on while she is trying to hunt down a killer in her district. It definitely makes for some interesting dialogue at times. 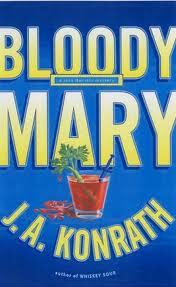 If you want a good laugh, a good mystery and just an overall fun time, I highly recommend this book (and series).